Hey. Remember back… oh, two and a half years ago when I told you about Mike. 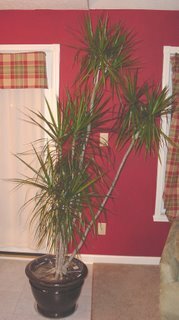 Yeah, you know, Mike the Dracaena Marginata (Not, apparently Draco) plant who lives in my house. Anyway, it seems apparent that he’s impossible to kill. He comes to mind as worth recording something about now since he recently came inside for the winter. At 7 feet tall and standing in our living room he comes to mind quite a bit. So indeed, that’s Mike. Now celebrating about 18 years in the family more or less. No way to be sure with my lousy recollections. Now lest some other persons in the family get jealous it’s probably wise if I also introduce Paul as well. Paul, like Mike, has been around for about 18 years and also started out in one of those tiny little 3-inch pots. 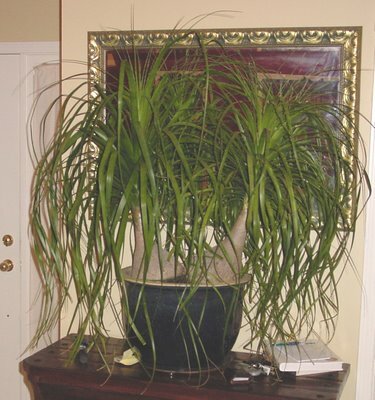 Now Paul does me the grand favor of breaking his ever-growing pot about once a year. Well, it’s that time of year again; yes, that time of year when my wife asks for a bench and I somehow manage to build something else. See, the instructions were pretty simple this time. She asked for a bench… well, specifically, this bench. Simple enough, right? Well, apparently not. All was going just swimmingly until one fateful night when she came out to the garage as I was working on the ‘bench’ and uttered those fateful words: “Man, this thing sure is big.” That, my politely quiet reader, was the beginning of the end. After a bit of quick checking it seems I’d completely hosed the dimensions on the desired bench. Yes, that’s right. The bench SHE wanted would fit very neatly and very precisely into the open space on my version. Indeed it was about 8 inches too tall. After the fact it was all very obvious but before the fact… well, no so. At any rate, it now makes a pretty tidy… well, something. Not quite a window seat (unless you’re 7 foot 4) but not quite just a bookshelf. But it’s useful and was not an utter and complete waste of wood in any case. Just mostly. 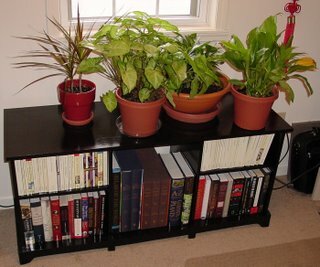 Total cost of this project with wood, primer, and paint: $80.